A dozen people diagnosed with “severe and persistent” mental illnesses face eviction from Casa del Mural, which is located on the county health services campus on Calle Real, to help solve the Santa Barbara County Alcohol, Drug & Mental Health Services’ (ADMHS) multimillion-dollar budget shortfall. The county has far too few residential treatment options as it is, according to advocates for the homeless and mentally ill, with the 12 beds at Casa del Mural making up about one fifth of the county’s total. Doug Barton, interim director of ADMHS, said that compared to other options on the table, the closure would save the most money while impacting the smallest number of people. Barton implied that the closure was not yet finalized, telling the Board of Supervisors on Tuesday, April 17, that it is “part of the proposed budget reduction strategy for fiscal year 2007-08, and not yet approved” by the board. However, preparations for the facility’s closure already seem to be underway. According to sources who work closely with residents, they were given 60-day notices on Thursday, April 12, and arrangements are being made to transfer four residents to locked institutions in Bakersfield or Sylmar. Mental Health Division Chief John Truman confirmed that social workers are actively seeking new placements but insisted that they are hoping to find unlocked placements in this community for all 12. 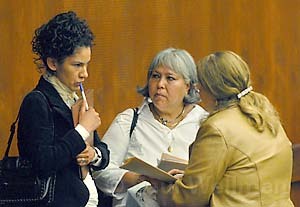 One resident, Marcela Sanchez Petalos, appeared before the Board of Supervisors on Tuesday with a petition signed by 10 residents including herself, asking the supervisors to “vote on our behalf so that the Casa del Mural does not close.” Supervisors expressed surprise at news of the proposal, with their executive staff assuring the public that a decision would not be made until June when supervisors tackle the budget-a process that includes public hearings. Casa del Mural’s proposed closure addresses a shortfall expected in the coming fiscal year. ADMHS is still trying to solve a $5-million deficit that arose in the current 2006-07 fiscal year, attributed by Truman to a smaller percentage of mental health clients covered by MediCal, partly because staff did not document all procedures and visits, thus causing the county not to be reimbursed for the services. Steep increases in pharmaceutical costs are another factor-though the medicines, he hastened to add, are often better. A third reason for the deficit is the difficulty of recruiting psychiatrists in the North County, where the county uses expensive psychiatric temp services instead of hiring doctors on a permanent basis. The county contracts with Work Training Programs, Inc. to operate the Casa del Mural program for a $500,000 annual price tag. Other programs suffering from the ADMHS budget shortfall include the pharmaceutical formulary, which is being restructured in such a way that patients may be forced to switch to less expensive medications than those they are currently using. Even if the Casa’s current residents are forced out, the facility’s beds will still be used for mental health patients, Truman said, but probably not for 24-hour long-term residential treatment. Advocates have begun a Web site, savecasadelmural.com, to prevent the home’s closure.